The size of Alaska (570,374 square-miles) dictates that conservation planning for landbirds generally be framed within a landscape context. 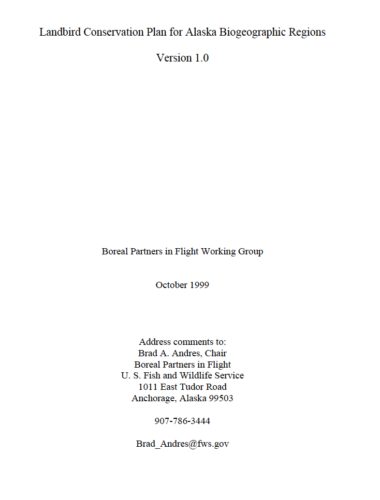 To form a Bird Conservation Plan for the state, species, and their habitats, and management issues were considered within 5 Biogeographic Regions. These regions closely correspond to 5 Bird Conservation Regions in Alaska (based on the Commission for Environmental Cooperation’s hierarchical framework of nested ecological units) that were recently developed. Identification of priority species, habitats, conservation actions were generated for each of the 5 Biogeographic Regions. The Alaska landbird avifauna is represented by 39 families and is composed of 260 species; 135 landbird species breed in the state. About 50% of landbirds breeding in Alaska have some portion of their population that winters south of the U. S. – Mexico border. Alaska has a single endemic passerine — the McKay’s Bunting. Using the prioritization scheme, we identified 34 landbird species that were considered a priority for conservation in the state. The number of priority species varied from 5 to 20 species among Biogeographic Regions. 2) riparian, deciduous shrublands and forests. These habitats support numerous long-distance migrants and residents and are the most imperiled by human activities.